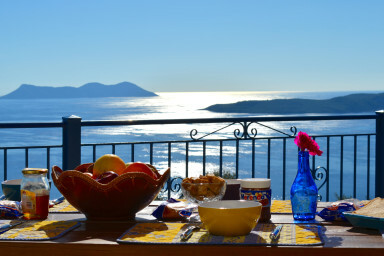 Each individual villa is already a corner of paradise from where our eyes are admiring an endless sea view. A real post card. For a large family or groups of friends who wish to enjoy their vacation together and, as well, to keep their intimacy, we are proposing you to book the full property with both villas. Once through the gate, the 4500 M2 of closed land with incredible old and majestics olive trees are only yours. Both villas with their own private pool, large terrasses linked to each others and so many small alcoves where to find intimacy or to share some time. Everyone will find the right place according to its desire. You only have to choose where to eat, where to play or where to tan. A luxury and unsual concept and rare done to live a great moment of shared happiness. A terrace which is used as summer dining area with its barbecue and another large terrace which surrounds the beautiful swimming pool (9x4m) equipped with its pergola and its outside shower looking to the sea and without any opposite. The living rooms and the parasols expect you so that you slacken among the scents of lavender, jasmine, honeysuckle, bougainvillea and laurel. A magic hammock tended between olive-trees centenaries will be your harbour for a total peaceful nest. Accessibility at the house (ground floor) as at outsides is very easy thanks to the tilted plans. No stairs will obstruct your displacements on the 2 principal levels. A living room comfortably equipped with a Television HD satellite as well as a small desk for working if need be. Dining room and kitchen (refrigerator, oven, microwave, dishwasher). 2 bedrooms with 2 singles (80 x 200) and possibility to change into a double bed (160 x 200). Bathroom (shower and WC toilet). 1 mezzanine bedroom with 1 double bed (160 X 200). Corner living room with sofa equipped with 1 television and DVD player. Bathroom with a large shower having a sight protected towards outside + WC toilet. Conveniences joined with the villa: washing machine . An immense terrace with a dining room of summer and its large exotic wooden table (8 people), its kitchen of summer and its barbecue. You will have also the privilege to shower you in all intimacy outside with an exceptional view over the sea. A pergola constitutes the corner “café” equipped with a sofa and armchairs to benefit from the last sun rays between friends to begin the evening by an aperitif. Comfortable sun beds expect you all around the infinity pool (8x4m) which gives the feeling to be prolonged in the sea. All the parts look at the sea by large bay windows. The lounge area equipped with a sofa and a sofa/meridian to benefit the maximum of the external sight continues on 180°. The dining room and its opened kitchen completely equipped (refrigerating/freezer, oven combined microwave, dishwasher) as well as a small bar and its own chairs. 1 corner television and DVD player with his 2 poufs giant to slacken. 1 bedroom with 1 double bed (160 X 200) and its private bathroom (shower + toilet WC) with a sight sea without equal and in all intimacy. A panoramic terrace supplements this parental room. 1 bedroom equipped with 2 beds (80 X 200) and the possibility of changing into a double bed (160 X 200) and its private bathroom (showers + toilets WC). This room has a large private terrace in exotic wood. She gives a direct access to the swimming pool. Conveniences joined with the villa: washing machine and complementary refrigerator. An independent and attic room is equipped with a large screen (160 cm ) and its home theater. For security reasons, it is reserved for persons over age 12 or children under the responsibility of adults . All the property (external / interior) is equipped with Internet by a private network WIFI. You will have a large outdoor parking with pergola to protect your vehicles from sun and the possibility of a playground (game of bowls, badminton…). A surface conveys proximity gives access directly Villa 1 and thus to facilitate the displacement of the people with reduced mobility. The principal terraces of the two houses are connected by a very short way in pavement. You can thus go from the one to the other very quickly. A general portal makes it possible to close the whole of the property for more confidentiality. Since Sivota, a concrete road will go up to the villa where panoramic views await you.